Water is an integral part of our society today. This vital resource is used in the operations of many industrial processes, human consumption, and for food production to name just a few. The increasing demands for water for agricultural, drinking and industrial processes have put significant strain on global fresh water supplies as the world’s population continues to grow. In many parts of the world, the demand for water has exceeded the supplies of traditional water sources like ground water and surface water. In the United States, especially in the Southwest region including California, the high demands and short supply of water has forced water scarcity restrictions on both industry and residential water users. This situation is forcing serious discussions by private and governmental level agencies to develop strategies to incorporate alternative water sources while implementing more efficient ways to use and reuse water. It is apparent, sustainable solutions will be required to mitigate the effects of climate change, reduce habitat degradation and provide for continued global population growth. Wastewater is becoming recognized as a significant water resource for non potable applications worldwide. Large centralized waste water facilities often treat and discharge this valuable resource rather than recycling and reuse it due to the costs associated with transporting the treated water back to the originating source. This paradigm shift has led to discussion of the utilization of a decentralized waste water solution approach that can be sustainably implemented on a community level as well as in a commercial/industrial facility setting to capture, treat and reuse this water resource optimally. Decentralized system solutions play a pivotal role in an emerging “green, clean, smart” paradigm for water resource design and management. Genesis Water Technologies is on the leading edge of designing and providing these innovative solutions. Recycled water can satisfy many non potable water demands, as long as the water is adequately treated for the intended application. In the USA, the EPA as well as the individual states regulate different aspects of the treatment of waste water and have established criteria for use of reuse water. As climate change extends the frequency & duration of droughts and storm events, populations grow, and water becomes scarce, centralized treatment systems may not be sustainable. A more sensible decentralized water infrastructure approach can assist in resolving significant and paralyzing water scarcity and regulatory issues, especially in drought-stricken or rural areas across the world. New processes and technologies now make customized site specific sustainable on-site systems cost-effective to install and maintain for both communities and facilities. This not only helps meet regulatory requirements, but also saves companies and communities money by reusing water and reducing associated water costs. Decentralized waste water treatment and reuse technologies are widely penetrating the market. Specialized waste water treatment and reuse systems such as the custom built system solutions provided by Genesis Water Technologies provide a sustainable infrastructure solution that benefits and supports companies and communities, preserves the environment, and creates a renewable water resource cycle. 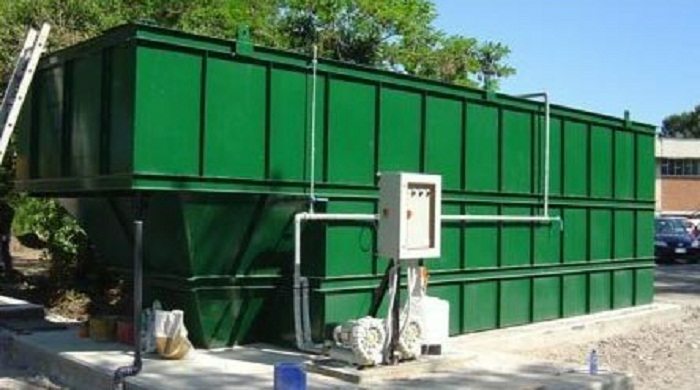 A camp operator required an efficient way to treat and utilize their domestic waste water to reduce their waste water discharge fees. The treated water was to be treated to a standard to be used for non drinking purposes such as irrigation among other non potable applications. Genesis Water Technologies requested a water analysis to analyze the composition of the domestic waste water source needed to be treated. The water analysis results were reviewed in detail to determine an optimized solution based on the specific type and levels of contamination in each water source. This domestic waste water source was composed of elevated levels of suspended solids, BOD, COD, ammonia nitrogen, and phosphorus. Our local partner consulted with the client and provided a presentation overview and diagram of the customized solution to meet the clients water quality challenge. The customized system solution included equalization and primary treatment to remove suspended solids, and reduce BOD/COD. Secondary treatment included aerobic oxidation via specific MBBR technology followed by filtration and optimized disinfection. The system solution was installed and commissioned by our local project management/contractor with technical assistance provided by Genesis Water Technologies. The treated water quality met all the clients’ parameters for both their potable and non potable water consumption needs. The treated water stream was microbiological safe and the client experienced reduced operating cost due to the reduction of their discharge water fees and the treated water was utilized for irrigation.